As prospectors looking to "strike it rich," students learn about the unique geology of the Pikes Peak region. Spanning the immense (the formation of the Rockies) to the minute (the three minerals in Pikes Peak Granite), students spend the Prospectors Discovery Group examining and identifying rocks they find along their journey to our Crystal Beds. Students form family groups and brave the 3,000 mile journey to our authentic 1890's homestead. At "Quick's," named for last resident John Quick, students explore the homestead's house, toolshed, barn, and potato cellar. While imagining life as a 19th century homesteader, students learn how the challenges of the land led to lives of simplicity, conservation, and independence. At our simulated Tipi Village, students learn how the Utes' intimate relationship with nature informed every aspect of life. Students first examine Ute life before European contact, learning how small family groups managed to survive high in the arid Rockies. Once arriving at Tipi Village, students learn about the Utes' rise to prominence as a resource-rich tribe in the West, and engage in village life activities. Following a group of grizzled mountain men into the wilderness, students learn the history of these early explorers of the American West. As they travel through "Trapper Meadow," students search for animal signs and learn basic fur trapper survival skills. 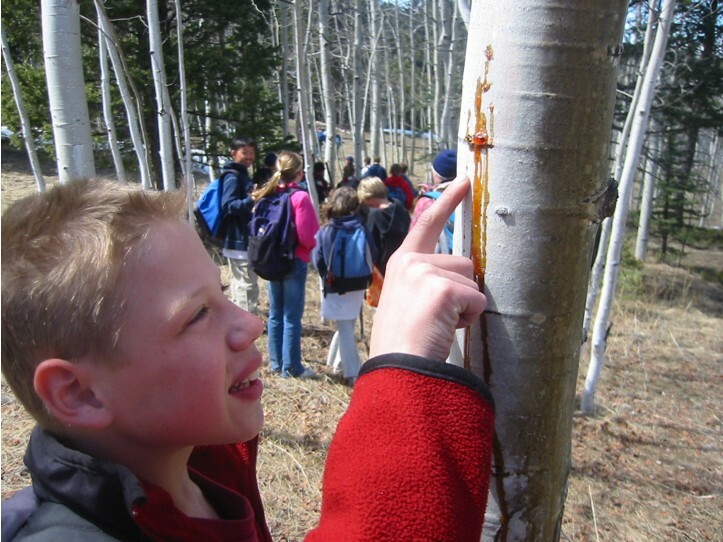 Through discussions with forest ecologists, ranchers, loggers, and fire jumpers, students examine the human and natural uses of trees. Students learn to identify different tree types and discuss the makings of a healthy forest. Students examine the world through the eyes of an explorer, making zoological and botanical discoveries. Students learn about historical exploratory missions, and then discuss what new explorations still exist. Energizers explores the physical properties of energy in nature, using simple machines and problem solving to create concrete examples of energy transfers. Students will construct a giant Rube Goldberg machine and experiment with pendulums, searching for evidence of different types of energy in nature. Students break out into expedition parties and learn how to navigate through mountainous terrain. Mountaineers learn essential items to bring on trail, and how to survive should things go awry high in the mountains. Games and initiatives designed to intentionally stress a group lead to meaningful discussions about communication. In this activity-packed Discovery Group, students build trust, communication skills, and leadership abilities. Crafters head into the woods to flex their creative muscles, looking to the natural world for artistic inspiration. Guided by artists with a love for natural forms, students discover that everyone has the capacity to create wildly imaginative art. As a group of aliens newly landed upon planet Earth, students look at the changing nature of our globe. Using our fossil-rich land as a resource, students travel through our Time Machine to learn about the evolution of life on Earth. A cattle drive from Texas to Colorado deposits Cowboys at our working cattle ranch, Witchers. At Witchers Ranch, students engage in ranch activities and examine the complex relationship ranchers and agriculturalists have with the land.